At National Landcare LLC, we love installing new landscapes. You’ll be amazed at the difference it makes in your yard with our lawn care services! We can take a boring or run-down space and make it come to life with perennials, shrubs, trees, and more. Tell us your ideas for your yard and we will work to transform them into reality. We can also help you combat erosion problems with retaining walls or update your irrigation system to better meet the needs of your yard. 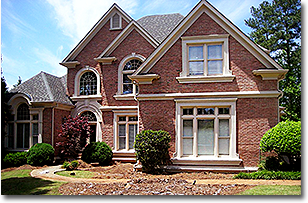 We always use high quality products and make sure your new yard is installed correctly and professionally. Updating your landscaping is about more than just making your property look more attractive. For homeowners, landscaping design services can increase the value of your house. Commercial properties like Atlanta hotels, restaurants, and apartments gain a huge advantage when their property looks clean and inviting. Draw in more customers or tenants than ever before with a well-maintained yard that will give them a good first impression of your business.